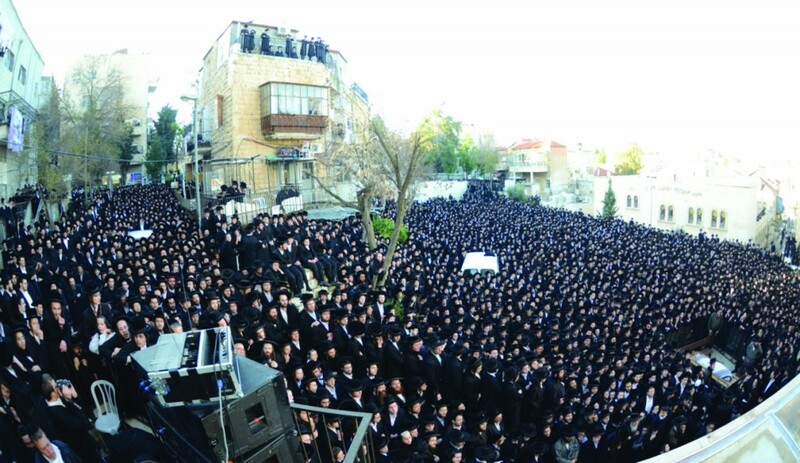 Thousands of people accompanied Harav Yaakov Yeshayah Blau, zt”l, a Dayan on the Badatz Eida Hachareidis of Yerushalayim, on his final journey on Monday afternoon. Harav Blau was also the head of the Eida Hachareidis kashrus organization and one of the most eminent poskim in our time on the halachos of Ribis and on Choshen Mishpat. His passing at the age of 83 is a great loss to the Torah world. He was a paragon of diligence in Torah learning and practical halachah, especially in complex areas, which were more familiar to him than the streets of his native city, Yerushalayim. Reb Yaakov was born in Yerushalayim to his father, Harav Baruch Yehudah Blau, z”l, the son of Harav Moshe Blau, z”l, one of the leaders of Agudas Yisrael in Eretz Yisrael prior to the establishment of the state. Reb Baruch Yehudah was one of the heads of Chinuch Atzmai and devoted himself to strengthening Torah-based chinuch. Reb Yaakov’s mother was the daughter of Reb Chaim Yosef Brach, z”l, of Yerushalayim. When he was three years old, his mother passed away, and young Yaakov Yeshayah was raised by his grandfather, Harav Moshe Blau. It was in this home, saturated as it was with ahavas haTorah, and a resolve to uphold anything holy and to help Yidden, that the young boy was raised. His grandfather was in contact with all the Gedolei Yisrael of the time, and so the gifted child he was raising was able to have firsthand contact with Gedolim and learn directly from their Torah, wisdom and Yiras Shamayim. Reb Yaakov studied at Torah V’yirah and Eitz Chaim, and later in the Mir. Already at a young age, he was extremely diligent in his learning and his brilliance was apparent to all those who came in contact with him. At the age of 18, he married his Rebbetzin, a”h, the daughter of Reb Chaim Yehoshua Roth, z”l, one of the askanim of Yerushalayim at the time and the right hand man of the Pressburger Rav, zt”l. Reb Yaakov and his Rebbetzin instilled their children with Torah and yiras Shamayim, and their home was also a source from which halachic rulings on a range of subjects was issued. After his marriage he continued learning in Yeshivas Mir, and then became a mechanech in Talmud Torah Belz in Yerushalayim. Torah was his whole life, but he preferred not to earn a living from his learning, and so for two years he served as a senior bank manager. But the Gedolim of Yerushalayim, aware of his greatness in Torah and yiras Shamayim, refused to forego having this diamond enhance the crown of Torah and halachah. Harav Velvel Mintzberg, zt”l, the Ra’avd of Kehillas Hachassidim in Yerushalayim urged him then to study hora’ah, and Reb Yaakov agreed. He received semichah from the greatest poskim in Yerushalayim, among them the Tepliker Rav, zt”l, and Harav Moshe Aryeh Freund, zt”l, the venerated moreh hora’ah in Yerushalayim at the time. The Gaavad, the Minchas Yitzchak, Harav Yitzchak Yaakov Weiss, zt”l, summoned Reb Yaakov 50 years ago and asked him to head the Eidah Hachareidis’ kashrus organization. In 5749/1989, after the passing of the Minchas Yitzchak, he was accepted as a dayan on the beis din of the Eidah Hachareidis, after previously having served as a dayan in many borerus cases and garnering a reputation for his halachic expertise. Already 35 years ago, he became known for his knowledge and piskei halachah in the halachos of Ribis and Choshen Mishpat. His famed sefer Bris Yehudah on the halachos of Ribis, named for his father, has been printed in many editions and has became the basic sefer for this topic. The sefer was also printed in an abridged, more practical version, called Kitzur Bris Yehudah. It does not have the in-depth analysis of the halachos that the full version has, just the practical halachah. Harav Blau’s sefer Pischei Choshen, a nine-volume set on the subjects of Choshen Mishpat, are widely used by poskim. It is a starting point for the formulation of any halachic rulings on Choshen Mishpat. He also compiled sefarim on other complex subjects, such as Chovas Hadar on mezuzah; Pischei Nedarim on the halachos of Nedarim; Melo Ha’omer on the halachos of challah; Pischei Mikvaos on the halachos of mikveh; and Birkas Yaakov on the halachos of brachos. The uniqueness of his sefarim was the clarity of the halachic rulings, after an in-depth analysis of the subject, no matter how complex. He would delve into the details of the halachah, and then issue incisive, clear piskei halachah. Reb Yaakov was also known to be very wise and people sought his advice both on halachic matters and matters relating to their lives. After the passing of his first wife eight years ago, he remarried his current Rebbetzin, tbl”c, who was very devoted to him. He recently fell ill, and over the past few days his condition deteriorated rapidly until he passed away on Monday. The levayah departed from his home in the Pagi neighborhood (Sanhedria) and proceeded to Zupnik Square, where the Badatz Eidah Hachareidis is headquartered, en route to Har Hamenuchos. He is survived by his Rebbetzin, and three sons, Harav Moshe Uri Blau, one of the heads of the Vaad Hakashrus; Harav Chaim Yosef Blau, a dayan on the Eidah Hachareidis, the Rav of the Shmuel Hanavi neighborhood, one of the heads of the Vaad Hashechitah of the Eidah Hachareidis and a Ra”m in Yeshivas Toldos Aharon; and Harav Shlomo Blau, the menahel ruchani of Talmud Torah Satmar, along with grandchildren, great grandchildren and great-great grandchildren. This article appeared in print on page 1 of the January 15th, 2013 edition of Hamodia.